See the How to Join page or contact Linda Detterman, Marketing and Membership Director, at lindamd@umich.edu or 734-615-5494. Consult the Get Help with Data, or contact User Support at ICPSR-help@umich.edu or 734-647-2200. From Detroit Metro Airport and Points East: Take I-94 West to Exit 177 (State Street). Turn right onto South State Street and head north. Turn left onto Packard Street. Cross Division Street and turn left into ICPSR's Perry Building parking lot. From Points West of Ann Arbor: Take I-94 East to Exit 177 (State Street). Turn left onto South State Street and head north. Turn left onto Packard Street. Cross Division Street and turn left into ICPSR's Perry Building parking lot. There is metered street parking on Division Street. See the Central and South Campus Map on the U of M Parking and Transportation Services Parking Maps page for details on visitor parking locations. Enter ICPSR through the main door facing the large (east) parking lot. 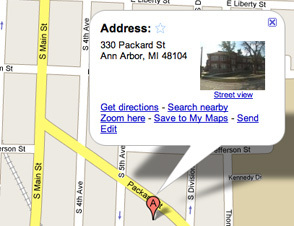 (The doors facing Packard St. are accessible only by University of Michigan ID cards.) The main door is unlocked Monday - Friday 8:00 a.m. - 5:00 p.m. If you need assistance, see the receptionist stationed inside the lobby.